Library Monday: Houndsley and Catina and the Quiet Time. The thing that always surprises me about the first real snow is how quiet the outside world becomes. Even though it is the same feeling of surprise each year, I never quite get over it. And I suppose that there is some physics-based explaination that includes sound waves and what not, but I'm not really interested in all that. To me, it just seems like magic. Which brings me right along to our Library Monday title for today: Houndsley and Catina and the Quiet Time by James Howe. Mariam and I both wholeheartedly loved this book from the very first read, and we have read it over and over again each winter since then. Sometimes in the summer too. Ostensibly a somewhat funny story about two snowbound friends and their need to get to an evening concert on time, Houndsley and Catina is really quite a bit more than just that. It is also a story about finding the beauty in the stillness of winter, about the slowing down of the world outside and about the good that it does for us when we slow down a bit too. Plus, the book has wonderfully expressive illustrations by Marie-Louise Gay that really bring the characters off the page and add subtle details that allow the book to be enjoyed again and again. And, I do have to make a special mention of the ending to this story. The concert scene that finally does take place at the ending of this book is perfectly written, and in some ways, the entire meaning of the story shifts when you read it. It isn't overly sweet and doesn't take itself too seriously, and yet, it is thoughtful and has just the right amount of depth. It leaves you feeling as though you have happened upon the quiet time yourself. :: Patricia's new book is here! If you are hoping to raise a writer, you absolutely need a copy of Patricia's book. I had a chance to read a review copy and as a writer, a teacher, and a parent, I can say with complete confidence that it is truly fantastic. And so practical. I love practical. We will be talking more about this soon! :: There are just a few hours left to purchase the e-book bundle! It disappears from the landscape of the interwebs at midnight GMT, which is 7 p.m. East Coast time. Which is soon. You can download it here. :: Imagination, creativity and inspiration are on sale today in honor of this Cyber Monday nonsense! Enter "monday" at checkout for 25% off issues of Alphabet Glue. Today only (expires at midnight Eastern time)! Some days, there are well-laid plans for an early naptime. These plans may include (but are certainly not limited to) such undoubtedly enjoyable and productive things as catching up on a bit of work, maybe even casting on for a new knitting project. But then again, some days there are small people awake at 5:30 in the morning, who are miraculously still awake and quite busy at nearly 11. So, so busy. And knitting gets set aside, replaced by some early day dinner prep in the event that the baby never sleeps again but people still want to eat. I like to plan for any and every contingency. In other news, Melitsa from Raising Playful Tots invited me to do an interview for her podcast recently. You can hear me ramble on about a wide variety of topics from the challenges of being The Play Dough Lady to our clear inability to limit our library haulings. Plus, I always think that after reading someone's words, it is kind of fun to hear their voice too. You can listen to the podcast here. And, today's theme on the Picture Book Month calendar is "imagination." Here are a few Library Monday posts about books that I think are particularly well-positioned in the imagination department. Enjoy! Library Monday: Under the Snow. I do know that it is only the beginning of November, I promise that I do. And, I know that technically, this means that it is still very much autumn in the Northern Hemisphere. But right at this moment, as I sit at my desk facing the living room windows and do the clickety-clackety thing on my computer keyboard, while the baby naps and the husband studies and the big girl searches for Waldo, right now, it is snowing outside. Just a little sprinkle of the fluffy, big flakes (the kind that don't stick), but snow all the same. Therefore, I vote that we all indulge me a little bit and make a little foray into the world of winter themed picture books today. Under the Snow, by Melissa Stewart, is actually a perfect picture book for both late autumn and early winter, because more than being just an inventory of which creatures are doing what out there in the wide world during snowy weather, it is an introduction to the basics of hibernation. Who does it, where they do it, how they do it. Stewart herself is both a biologist and a science journalist, and this knowledge of animal life together with a background in writing about it results in a picture book that is both an enjoyable read and a great introduction to basic scientific facts. Indeed, paired with bright and textured watercolor illustrations by Constance R. Bergum, Stewart's descriptions of various animals and their winter survival strategies are well-composed little teasers that would make great starting points for inspiring deeper investigations into the lives of the animals that they discuss. Through the exploration of different habitats and their animal residents, Stewart gives the reader a compelling peek into the winter workings of the natural world, and it is one that will both satisfy and pique curiosity in small and big people alike. If you are feeling at all ready to broach the subject of the coming winter at story time at your house, this book would be an excellent place to begin. As promised, I'm going to run Alphabet Glue specials here and there all month long in celebration of Picture Book Month. This week, all issues are buy-two-get-one-free. When you purchase any two issues, just leave a "note to seller" mentioning the third that you would like me to email to you for free. This deal applies to the multi-issue bundles as well and is good through Saturday 11/10! Printable Bunny Bookmarks for You. Today was one of those days when I could tell from the outset that the small fry was going to be a restless napper and therefore, if I was smart, I would be very, very quiet while he was sleeping. And, since today is most officially dedicated to all things rabbit on the Picture Book Month calendar, the obvious nap time activity choice was making you all a set of free bunny-themed bookmarks. Okay, well maybe not obvious, but that is what I did nonetheless. You can download the bookmarks by clicking below. Enjoy tucking them into a book near you! Picture Book Month has Arrived! As some of you dedicated bibliophiles out there are likely already aware, November is also marked on many calendars as Picture Book Month. Yes indeed, an entire month-long celebration of my undoubtable favorite among genres. Between preparing for big storms and sorting out Halloween costumes, this particular November snuck up on me just a bit, but I am still hoping to have fun picture book related suprises popping up here throughout the month, and will be running lots of specials on Alphabet Glue as well. Because what better way is there to celebrate the wonder of picture books than by diving into pages upon pages of booklists and related crafts and activities? "...many books contained in one. Part journal, part field guide, part cookbook and part narrative, Three Days is the story of a pair of cousins on a first canoe trip with their mothers. The story begins with the finding of a red canoe for sale in a neighbor's yard and follows the family as they set out to recreate a canoe trip taken by the kids' mothers when they themselves were young. The reader is introduced to tent-pitching, knot-tying, and the importance of life jackets, all while enjoying the feeling of being a part of this little family on their big adventure. I love this book for many reasons, not least of these being the idea of the clever, skilled and adventure-ready moms who know how to show their kids a seriously good time- despite rain, wind, waterfalls and unexpected canoe tipping. Don't we all like to think that we've got a bit of that spirit in us as we try to raise our small people to see the natural world with appreciative eyes?" This book is one of my favorite picture books of all time, and despite the fact that the waning days of autumn aren't particularly ripe for family canoe trips, I would suggest that you run to your local library and find a copy of this one right away (if you haven't read it already). Then, you can make the super easy and very fun paper boats described in the downloadable PDF file below. In the likely event of inclement weather, you could totally sail these in your bathtub or a mud puddle. As for celebrating Picture Book Month over in Glueland, between now and Monday November 5th, all issues of Alphabet Glue are 20% off when you enter the code "picturebook" at checkout. I'll try to have some kind of special all month long, because if there is one thing that I can honestly tell you that I believe in, it is the importance of picture books in our libraries, on our bookshelves and in our laps. 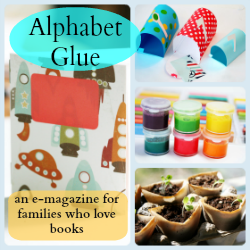 And, if I'm doing my job at all right, Alphabet Glue really is a great resource for helping to make the love of books a part of daily life.